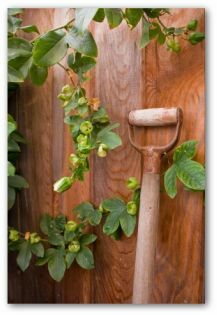 Here are some great ideas for vegetable garden fencing, and fence plans! Included are easy DIY vegetable garden fence, garden border, ornamental and picket fence ideas. Learn how to find materials for cheap garden fences as a weekend project. A garden fence can be a necessary part in keeping your vegetables garden safe and secure. 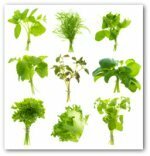 Growing and harvesting full flavored produce and seasoning herbs is essential to a healthy life for you and your family. 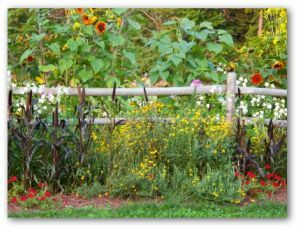 There are several reasons to build fencing for your plants which include supporting, decorating, and managing the garden area. A well built wooden vegetable garden fence offers support to growing plants. 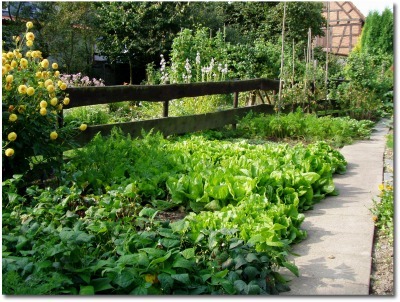 Many hours are spent on vegetables gardening inspecting the plants and its surroundings. Successful gardeners keep a watchful eye on any corrective actions that can be taken in caring for its healthful growth. 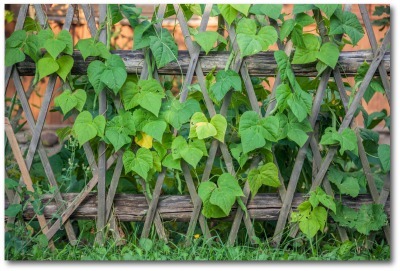 Climbing and vining plants benefit from structures like fences to climb on for support. 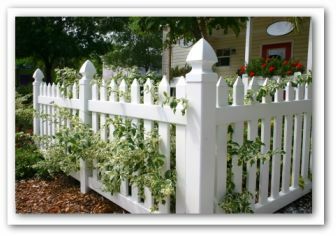 Nothing beats the old-fashioned charm of a white picket fence around your garden area! Today's vinyl picket fence material is long-lasting, and maintenance free. You might want to avoid using any fences constructed of pressure treated lumber which is saturated with toxic chemicals. The toxins make the wood a potential hazard to children and pets, making its use questionable in an edible garden. Aside from being decorative, some garden enclosures are maintenance free. Once the vegetable garden is fenced in, fencing such as vinyl or wrought iron is guaranteed not crack, fade, peel, rust, rot, or ever need painting! Build cheap garden fences from materials that you already have on hand. If you have access to a store that sells recycled building materials, sometimes you can find just the perfect inexpensive old wood to design a garden fence. Visit Craigslist or your local newspaper ads to see if someone is giving away free or nearly free materials that can be used for fencing, if you come haul them away. Or visit your local building material store for materials such as posts and lattice panels. This type fence is relatively cheap to build, and is good support for climbing vegetable plants as well. The openings in the lattice are small, so most small garden pests will not be able to climb through. 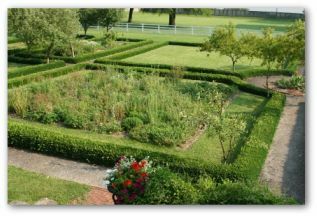 Whether you will need fencing installed for your vegetable garden depends on where the plot is located. In many areas a vegetable garden fence is needed to defend the plants from wildlife such as opossums, deer, rabbits, skunks, and turtles. Neighbor's pets can also be a problem. No one likes the ideas of their garden being used as the neighborhood animal public restroom! Keep the Wild Critters Out! Do not be intimidated by the wild animals scheming to find their way in to your garden. Installing a garden fence is very easy to do. Most animal raiders who drop by for a midnight snack are basically timid and do not like to be caught up in enclosed spaces. You cannot really blame the creatures for wanting to taste the delectable vegetables! It may be necessary to install a vegetable garden fence tall enough to keep out the deer and bury parts of it underground against critters like the groundhog or opossum. 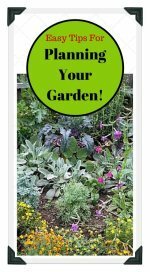 Besides worrying about uninvited guests like deer jumping the garden fence, you may want to maintain your vegetables from straying into a neighbor's yard. For example, mint grown in vegetable garden beds spreads like wildfire into adjacent lawns. There is a wide variety of wire garden fences that are not extremely costly. An advantage with wire is that it can be moved easily. Chain link fencing is one of the most popular styles but is more expensive, requiring fasteners and aluminum posts. Another option is wooden fences which also require fence-post setting. Permanent structures will be reflected in the higher price. 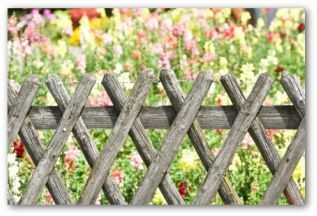 Last, a garden fence can help overcome the drawbacks of a shady spot in your garden. Erecting a light colored fence in the sunniest part of the site will reflect sunlight into shaded areas. Protect your valued plants at all costs from the time they are planted in the garden until they land on your table!